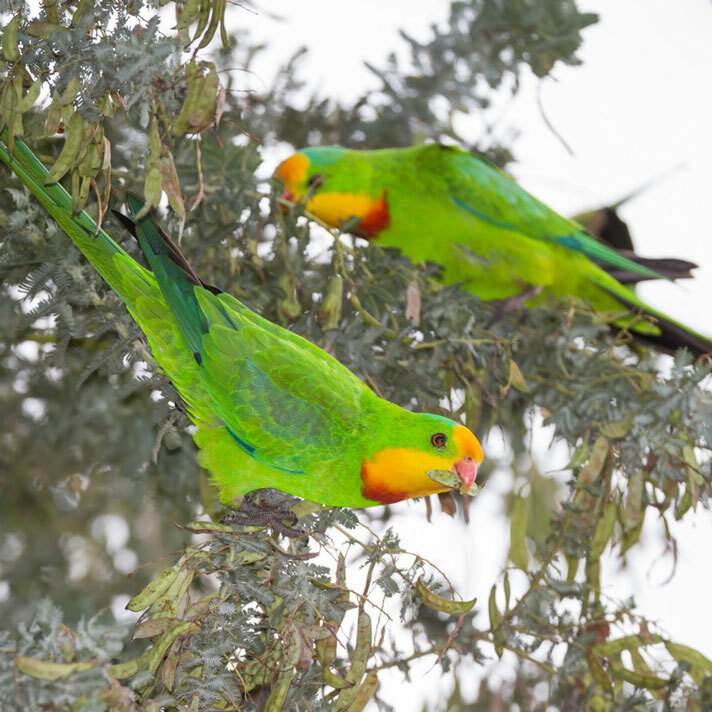 Difficult Bird Research Group runs the national monitoring programs for the swift parrot, regent honeyeater, forty spotted pardalote, superb parrot and the palm cockatoo, and we are leading an urgent intervention to rescue to orange bellied parrot from extinction. Swift Parrots are a critically endangered nomadic migratory bird found only in south-eastern Australia. Their small population of less than 2000 birds is continuing to decline largely due to loss of habitat in both their breeding range (eastern Tasmania) and non-breeding range in south-eastern mainland Australia. A newly identified threatening process, predation by introduced sugar gliders in Tasmania, is also a major driver of their continued demise. Sugar gliders kill and eat adult female swift parrots while they are incubating their eggs, as well as the eggs and nestlings. Up to half of the nesting parrots can be eaten by sugar gliders every year. 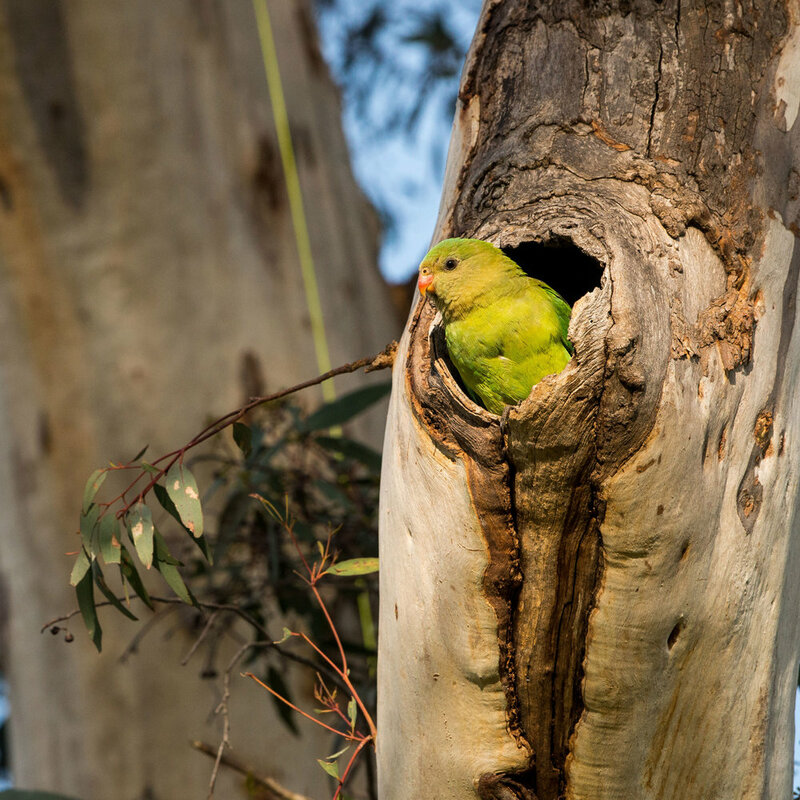 Swift parrots require two distinct but related habitat features to breed (1) food from flowering trees and (2) tree hollows for nesting. If these resources don’t overlap in space and time, breeding cannot occur. 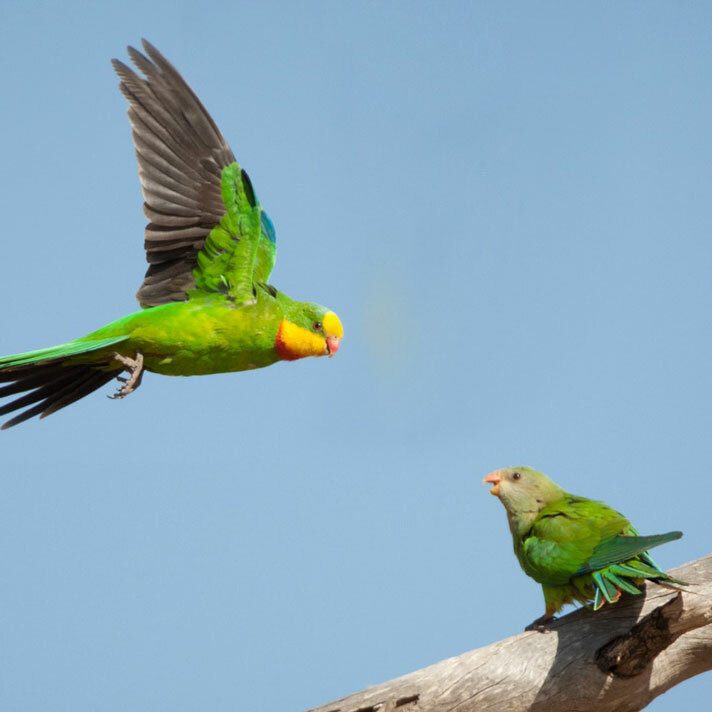 In their wintering range, swift parrots undertake long distance nomadic movements to find food. 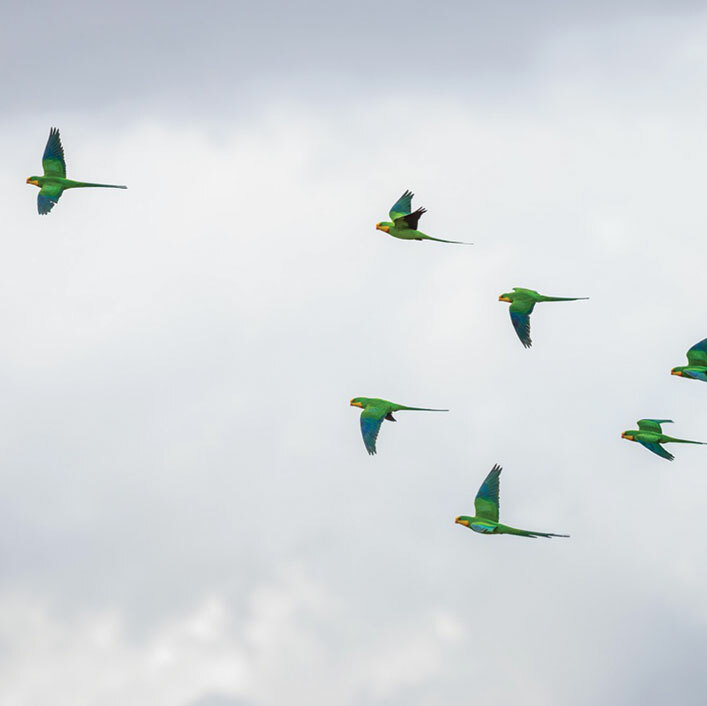 Swift parrots depend on suitable conditions across multiple, distant locations throughout their migratory cycle. Managing the species poses substantial challenges because of the great plasticity in their annual movements in response to highly variable climatic conditions, their drastically reduced numbers and their dependence on habitats in modified landscapes. Swift parrots also nest in extremely remote and rugged terrain in Tasmania, nesting in treetops of old growth forest. 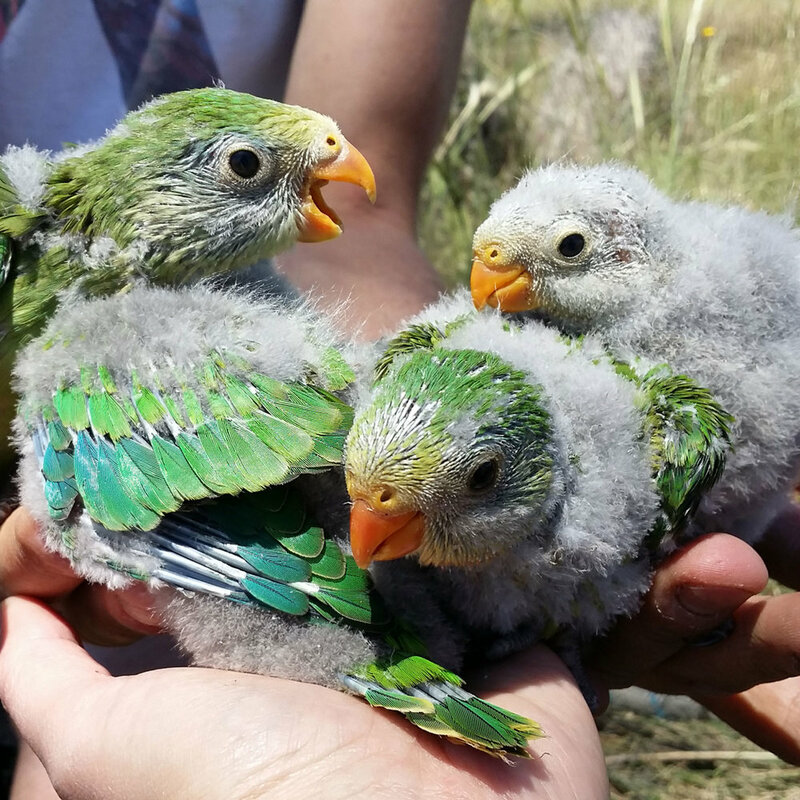 We established a population monitoring program in 2009 through collaboration between the project team, the Swift Parrot Recovery Team, the Commonwealth and Tasmanian Governments and BirdLife Australia which addresses key actions of the swift parrot Recovery Plan. 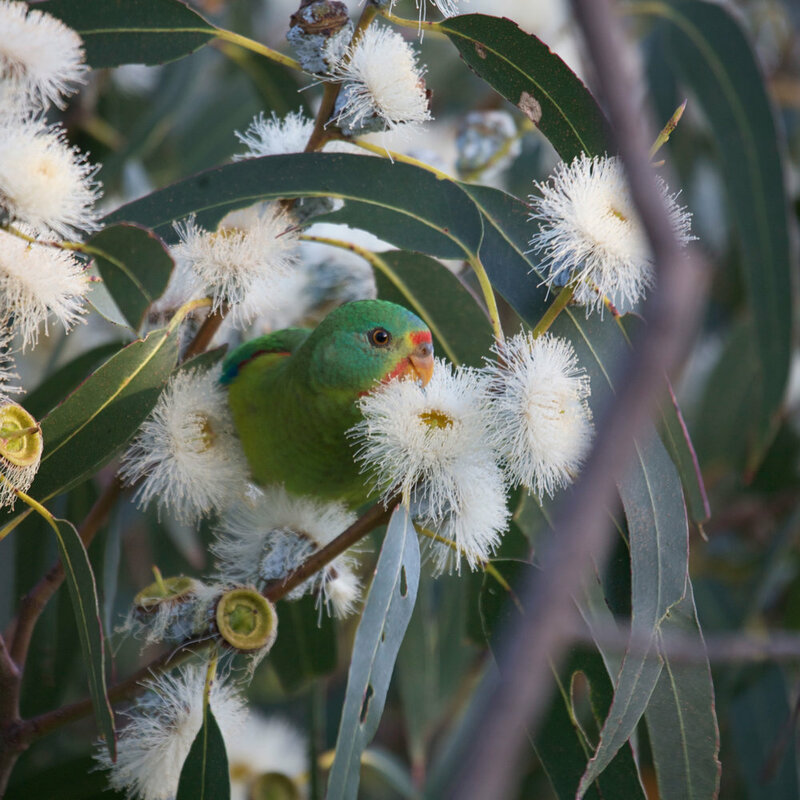 The monitoring program surveys >1000 sites in potential foraging habitat across the breeding range to track annual variations in the distribution and relative abundance of the swift parrot population and provides a measure of available breeding habitat as defined by tree flowering. Results from this landscape scale monitoring are then used to guide a survey of nesting habitat to assess the spatial distribution and density of breeding birds and factors affecting nest site selection. 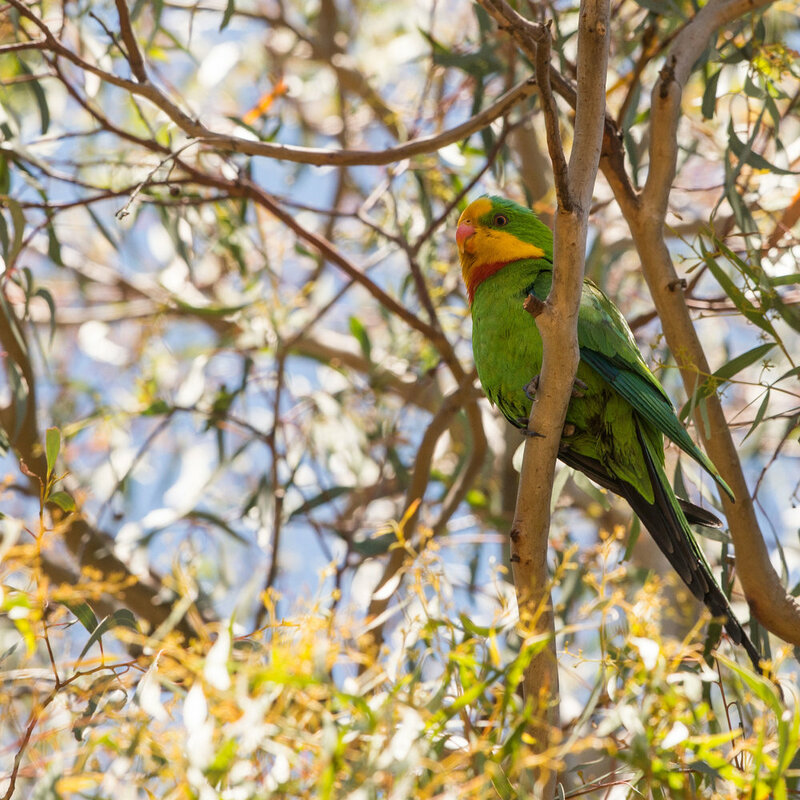 These data have allowed us to track trends in swift parrot site occupancy and abundance over several years, investigate habitat use and to identify priority areas of habitat. These data are crucial for understanding how the birds respond to patchy and unpredictable tree flowering events by shifting the locations where they breed. We also are working on the Australian mainland where swift parrots spend the winter. In collaboration with the NSW Government we are undertaking a project that focuses on the western slopes in the Riverina and drought refuge habitat on the Central Coast. This work represents the most extensive winter habitat restoration project ever undertaken, and will build on long term knowledge about the species winter habitat use. 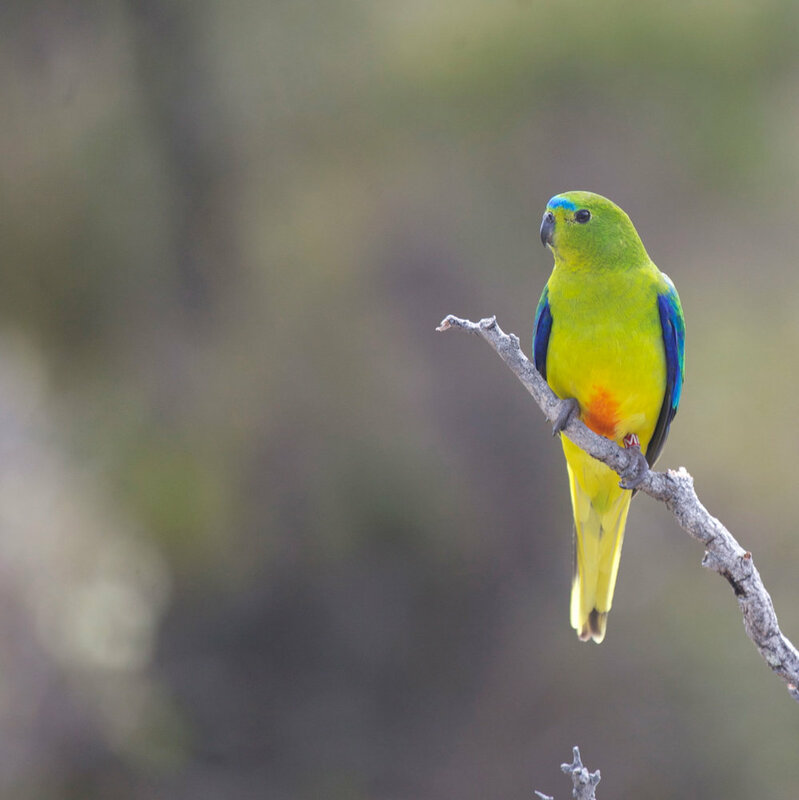 We are also investigating changing use of habitats over the past 20 years on the Australian mainland by swift parrots, as well as the implications for land management in relation to changing climate. Using our landscape scale monitoring data, we identify where swift parrot nesting aggregations occur each year across Tasmania. 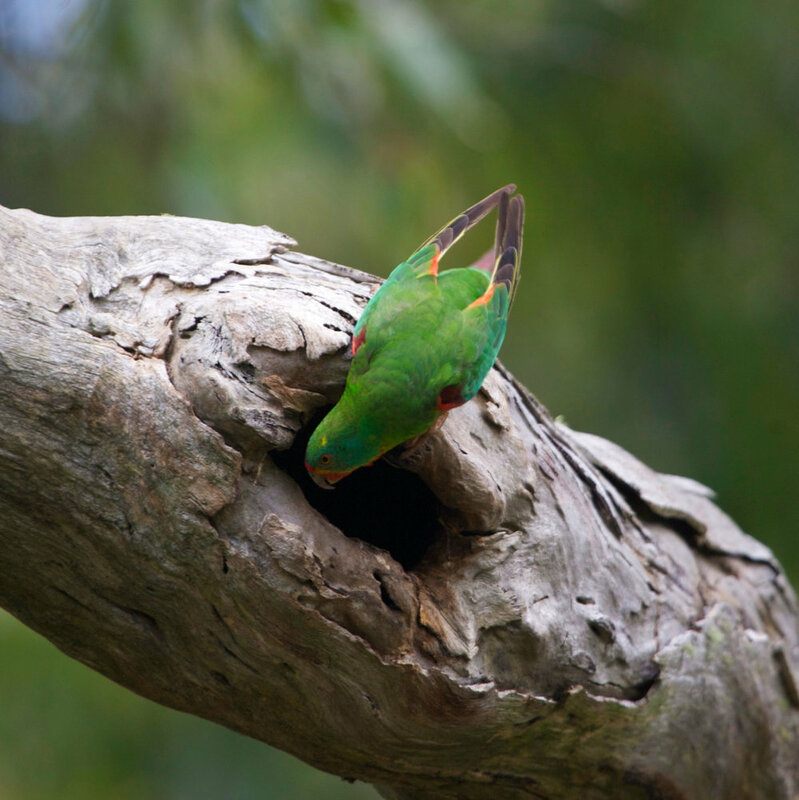 Swift Parrot breeding sites vary annually over a large range of fragmented habitat in south-eastern Tasmania, with the exact location of breeding each year depending on the intensity of local blue or black gum flowering and the availability of tree hollows for nesting. We are leading the first study to identify determinants of their breeding site choice and reproductive success against the backdrop of the annual variations in the distribution and availability of breeding habitat which has been dramatically altered and fragmented since European settlement, and the increased mortality rates due to predation by introduced sugar gliders. Our research has shown that nomadic movements within Tasmania to the best available flowering conditions to breed successfully, but that the effect of sugar gliders on their populations can be very severe in some places. 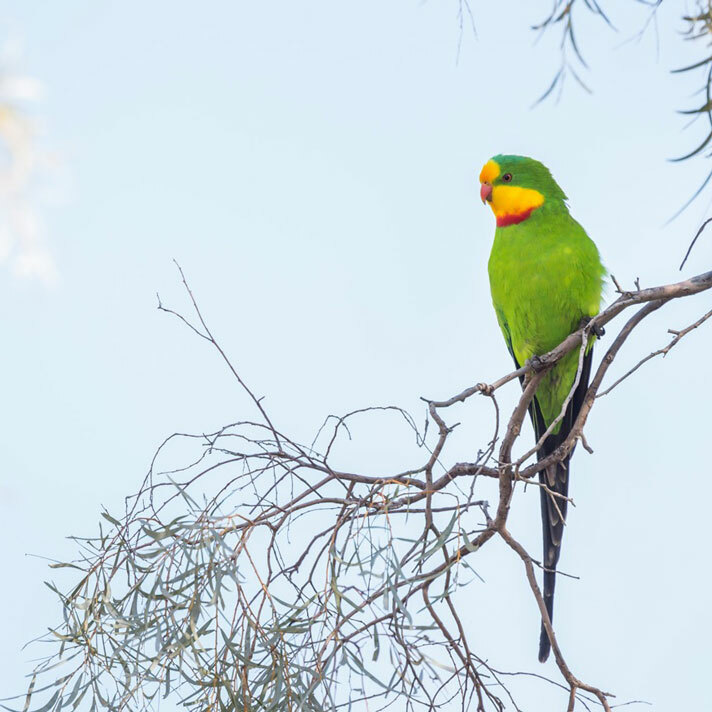 We are also undertaking ground breaking research using high tech GPS loggers and motion activated cameras to identify where breeding swift parrots search for food while nesting and to identify the causes of nesting failure. The regent honeyeater is Australia’s most threatened songbird. Once common throughout the south-east (including suburban Sydney and Melbourne), the population has crashed since the 1960’s due to extensive land clearing. It is now on the verge of extinction, listed as critically endangered under national and international legislation. Best available data suggest that fewer than 400 individuals remain and population decline is ongoing. Regent honeyeaters exploit flowering events to feed on a select number of Eucalyptus species, with a strong preference for highly threatened Yellow box Eucalytpus melliodora and Mugga Ironbark Eucalyptus sideroxylon. Current knowledge suggests their movement and settlement patterns reflect high spatiotemporal variability in the timing and intensity of flowering events in their preferred food trees. The birds nest during the Austral spring/summer and can form small breeding aggregations where habitat conditions are suitable. They are territorial and aggressively defend their nesting area. Regent honeyeaters are highly mobile and extremely elusive. With its small population size (<400) and massive range (>600,000 km2) finding this species, let alone studying it, presents a world of challenges. There are very few places where the bird can be reliably detected between and within years. This has severely limited attempts to understand why the regent honeyeater has declined so severely and rapidly, particularly among other co-occurring nectarivore species that persist at high abundances in similar environments. 5) Determine how the population decline could affect the song repertoire of the regent honeyeater, particularly individual males. Despite it’s iconic status and the urgent need for conservation advice, no standardised range-wide monitoring protocol exists for the regent honeyeater. To date, our entire understanding of population size and trajectory is drawn from haphazard landscape-scale surveys and, crucially, incidental sightings from members of the concerned public. 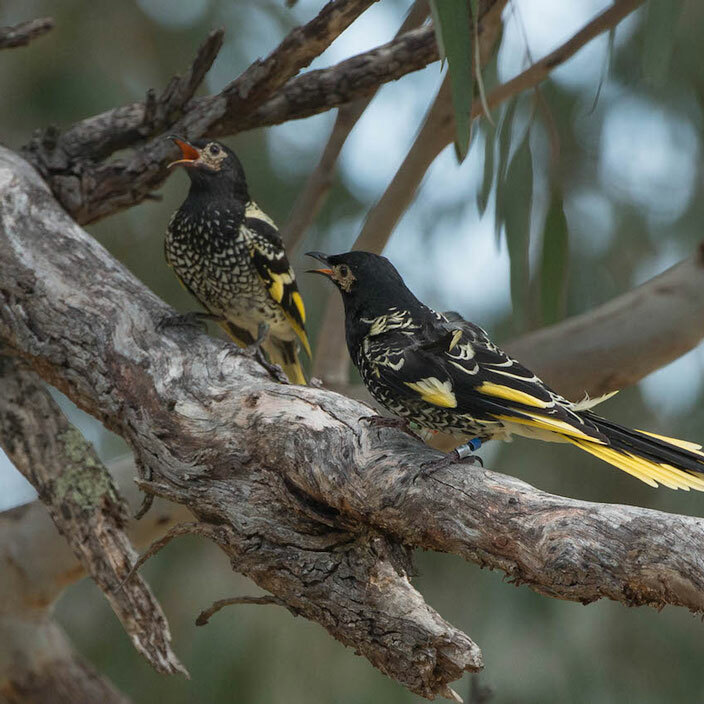 Strategic and standardised monitoring of the regent honeyeater population across its full extent of occurrence is vital for (i) deriving robust population estimates, (ii) identifying critical breeding and foraging habitat, and (iii) directing effective conservation action. Importantly, a holistic national-scale approach to monitoring allows for comparisons between and among known breeding landscapes, across space and through time. Such information is currently unavailable, but will be essential for (i) understanding interactive and emerging threats to the species’ survival, (ii) tracking variation in the abundance and availability of critical foraging and nesting resources, and (iii) forecasting the impacts of climate change on regent honeyeater distributions and population persistence. Further to a holistic approach, monitoring for this rare and highly mobile bird must be targeted. A monitoring program tailored specifically to the species’ ecology is crucial for maximising return (i.e. sightings) on investment (i.e. search effort). With fewer than 400 birds spread across an area the size of France, strategic site placement is key. In turn, we have gone to massive efforts to gather the most up-to-date knowledge on regent honeyeater ecology and used all available sightings data to construct highly sophisticated species distribution models to design our new national regent honeyeater monitoring program. Using these models, we have identified areas of priority habitat for the regent honeyeater based on predictions of high suitability across multiple years and varying climatic conditions. 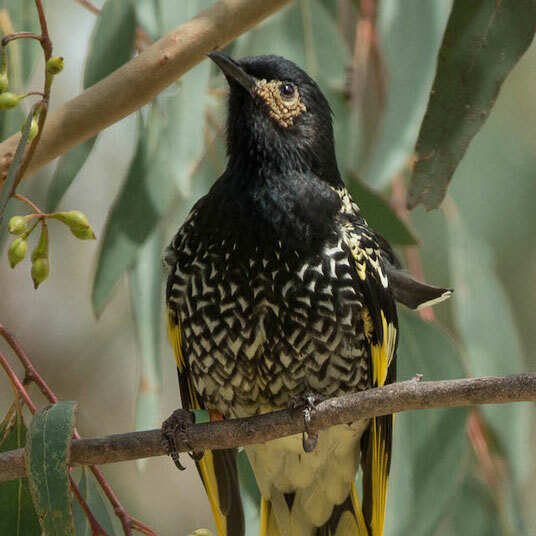 We have established over 1,000 sites in these priority areas, including all regions defined as “key breeding areas” in the updated Regent Honeyeater Recovery Plan. Surveys are repeated five-minute point-counts to record regent honeyeater presence-absence and abundance at each site. Surveys take place during the breeding season when we record the distribution and abundance of the regent honeyeater population in both breeding and foraging habitat across their known range. During each survey, we also record all other birds detected and score flowering of potential food trees on a scale of 0 to 4, where 0 = no flower, 1 = light, 2 = moderate, 3 = heavy and 4 = very heavy. This provides a broad-scale measure of food abundance during the breeding season. We have developed a monitoring strategy that is successfully locating birds at multiple scales. Our surveys are providing a reliable guide to the location of nesting events. To date, we have monitored 49 nests, from which we will (i) quantify rates of nesting success, (ii) identify the causes of nesting failure, and (iii) elucidate the importance of the nectar resource to nesting birds. This knowledge will be used to inform management actions to enhance the breeding success of wild regent honeyeaters. For the 2016/7 season, we have up-scaled our monitoring efforts in the Capertee Valley, search and monitoring birds at the landscape-scale. These data will enable us to study habitat associations between regent honeyeaters and its competitors (including the hyper-aggressive noisy miner), and effectively guide immediate and future management of competitor populations at critical regent honeyeater breeding locations. These monitoring data will also be used to examine landscape-scale changes in flowering phenology to determine how nectarivores differ in their distributions, and their dependence on nectar, through time. To date, we have colour-banded 42 regent honeyeaters, providing us with very useful movement and survival data. DNA samples have been obtained from all banded birds and are currently being processed in the ANU laboratories to form a key component of a population genomics study. Regent honeyeaters have a song repertoire that is highly variable between individuals. Hence, we have recorded the song of every individually-identifiable male regent honeyeater to examine the implications of song variation for fitness. We have also commenced satellite tagging of noisy friarbirds to investigate their role as a potential surrogate for macro-scale nectarivore dispersal patterns. The forty-spotted pardalote is an endangered and highly specialised species. Forty-spotted pardalotes are endemic to eastern Tasmania where they co-occur with two other pardalotes (the spotted and striated). Their historical range covered the east coast and some offshore islands but they are now restricted to small offshore islands, headlands and peninsulas in south-eastern Tasmania and Flinders Island in the north. Forty-spotted pardalotes use small tree hollows for nesting, in which they build a dome shaped nest out of grass, tree bark and feathers. They also are dependent on white gum (Eucalyptus viminalis) where they forage for arthropods and manna (sugary exudates from leaves and branches). Forty-spotted pardalotes are threatened by habitat loss and degradation, introduced predators like sugar gliders, competitors, drought and poor dispersal ability. Our research discovered a new threat for this species- parasites. A screw worm fly (Passeromyia longicornis) lays its eggs in the nests of forty spotted pardalotes, and the maggots burrow into the skin of nestling pardalotes, where they drink the blood of the baby birds. 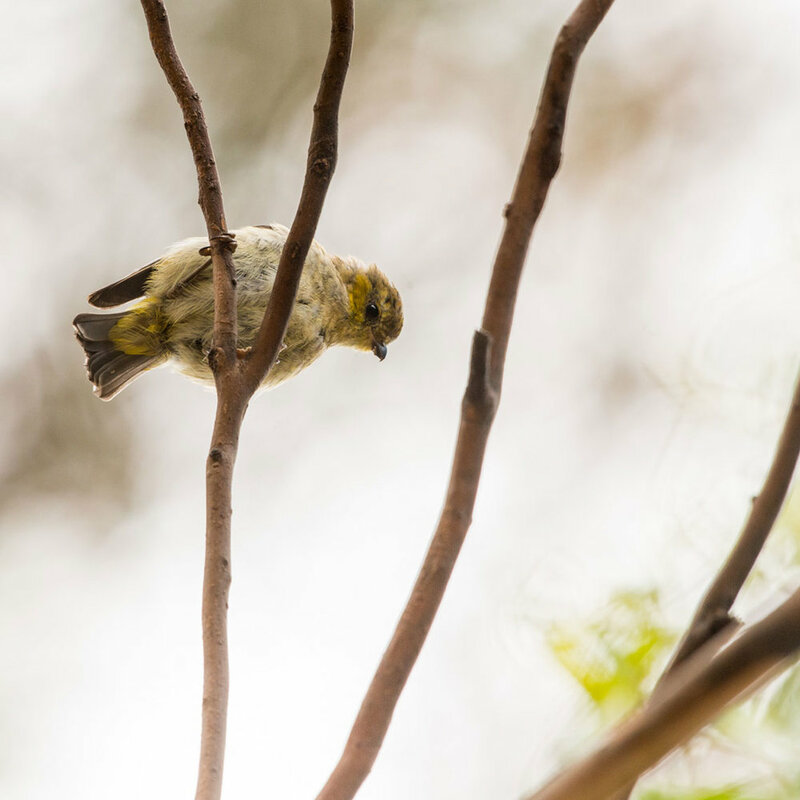 Unsurprisingly, this leads to very high mortality rates of fly-struck pardalote nestlings and is the primary cause of nesting failure identified in this species. Forty-spotted pardalotes are elusive because are smaller than a matchbox and live high in the canopy of E. viminalis dominant or subdominant forests. These small birds can go unnoticed if the observer is not able to recognize their quiet call and monitoring the nests of wild birds in tiny tree cavities is extremely challenging. 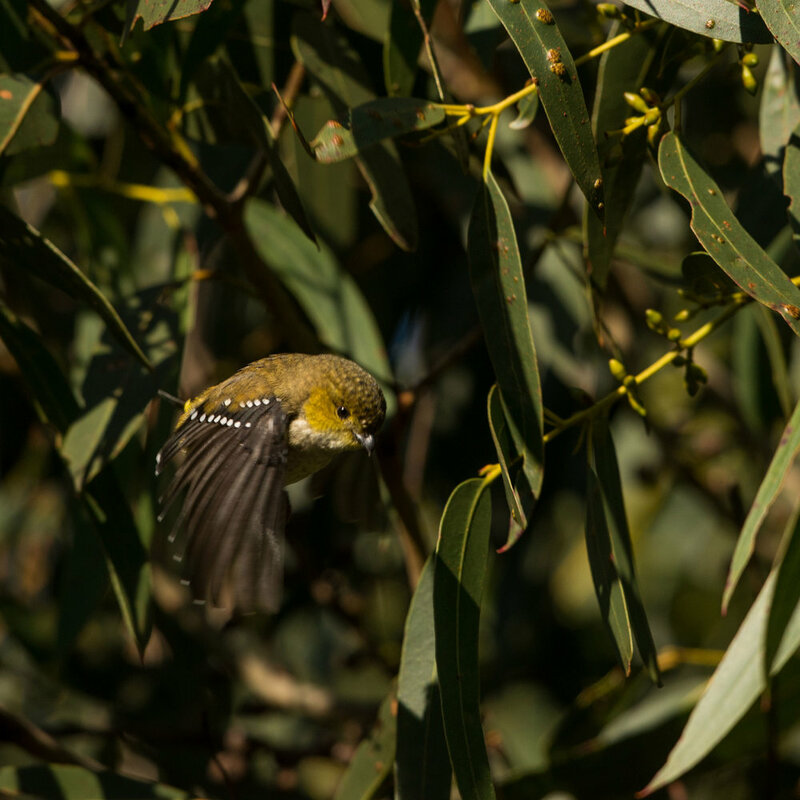 Since 2010 we have been conducting a monitoring program for Forty-spotted pardalotes over their entire remaining range (North Bruny Island, Maria and Flinders Island) to track changes in their population patterns of occupancy and abundance. Our monitoring program recently led to the discovery of a new population of forty spotted pardalotes in a location beyond their known range- a major conservation win for this species. We use this monitoring to identify what habitat characteristics are most important for supporting pardalote populations, and identify ways to make new populations safe from known threatening processes. This research will be used to develop a framework and feasibility analysis of the potential for experimental reintroduction of the species to parts of its historic range. Further our monitoring program has allowed us to derive the first robust population estimates for this poorly known species. We have been monitoring the breeding success of Forty-spotted pardalotes at a network of nest boxes on North Bruny Island since 2012. This array of nest boxes allowed us to discover that parasitic fly larvae are responsible for high nestling mortality. Our group tested and now implement techniques to manage the incidence of fly parasitism using bird-safe insecticide to fumigate nests, which substantially improves nestling survival. We are using the existing network of nest boxes already occupied by pardalotes to investigate their sensitivity to different management interventions (fly control) and experimentally deploying new nesting boxes into relict populations of unmanaged pardalotes to establish whether they respond to management intervention. Palm cockatoos are large, charismatic and emblematic birds of northern Australia and New Guinea yet our research suggests they are in steep decline. We study the demography and dynamics of the entire population on Cape York Peninsula and the causes of their decline including large scale habitat loss from mining, changed fire regimes and low reproductive success. Palm cockatoos are the only non-human species that manufactures and uses a sound tool. The males make drumsticks by breaking off a branch, stripping the foliage and trimming to appropriate length. They then grasp the drumsticks in one foot and beat them against a hollow trunk as part of their display to females. Our project explores this remarkable behaviour and the aspects of intelligence required to make and use tools in such a human-like fashion. 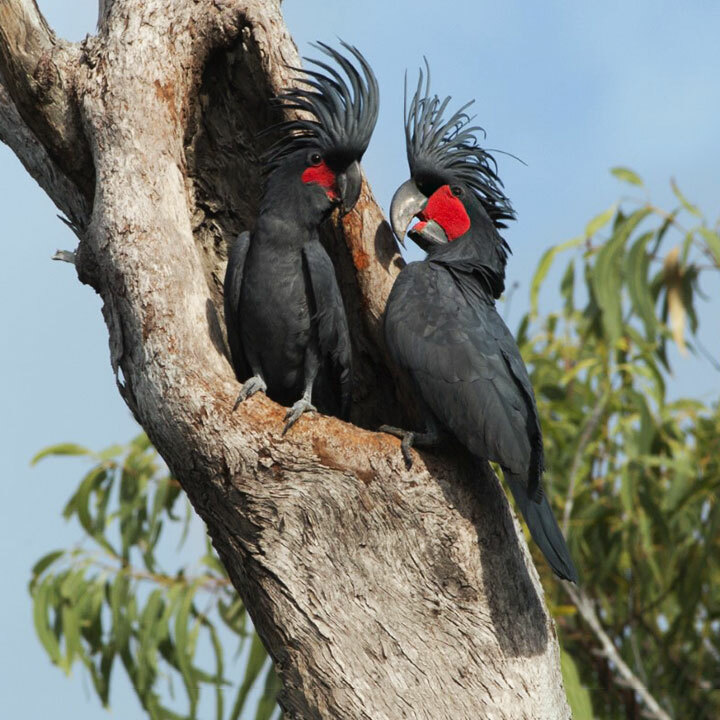 Palm cockatoos are found in remote parts of Cape York Peninsula 10-20 hours drive north of Cairns. They only occur in the small bands of woodland adjacent to rainforest. They are shy and elusive and all but impossible to catch, necessitating alternative methods for studying them, and lots of patience! Only by understanding their movements and behaviour intimately have we been able to approach, observe and gain precious DNA samples for population genetic analysis. We climb the trees when safe but use cameras mounted on tall poles to see inside the nests when the wood is too old or rotten to support our weight. Members of our team have been researching this species since 1999. The initial emphasis was on breeding biology and ecology of palm cockatoos in the rainforests of the north east coast. This population was shown to be in steep decline due to very low rates of reproduction. Females were shown to lay only one egg every two years on average, and that one egg only had a 20% chance of leading to a fledgling. On this basis palm cockatoos were declared Vulnerable by the Australia Government which led to greater legal protection. 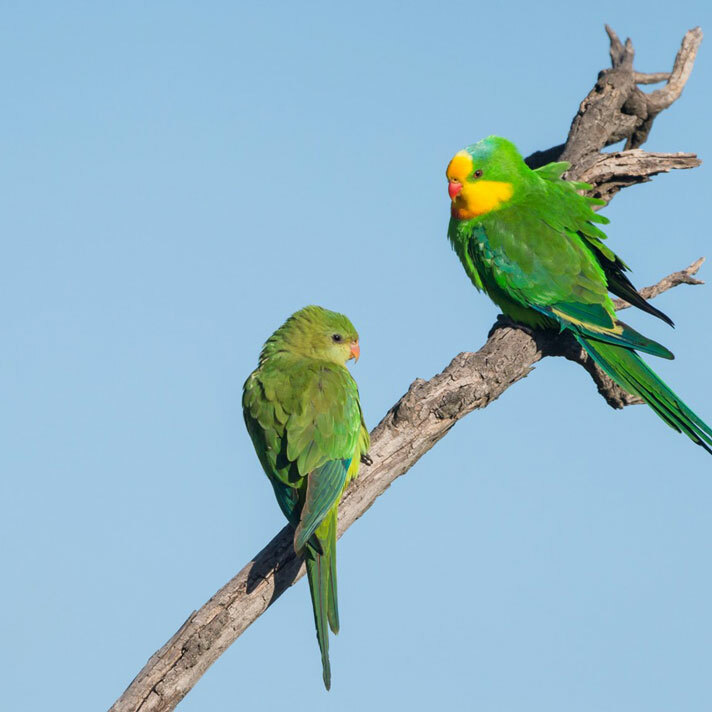 We have extended this research to include the other populations on Cape York Peninsula to see whether they are connected enough to buffer the east coast population from decline. Our work includes comparison of calls between the populations (eg west coast versus east coast) and population genetics to determine the connectedness of the populations, and will lead to a population viability analysis to determine the conservation status of this species in Australia. We have succeeded in videoing this incredible behaviour on over 60 occasions and have analysed the patterns and context of the performance of males. Initial results confirm that the behavior is remarkably analogous to musical instrument use in humans, to the extent that it is likely to constitute the only animal parallel for this complex human behaviour.